Yes. With Slider by Supsystic PRO you have the ability to customise the look and feel of arrows and caption effect in your slideshow. It doesn’t matter, you chose Bx slider, Jssor or any other – tons of options are there for your comfort and creativity. Choose Caption – use the editor options to change: text align, color of text and background, text size, enable text animation of caption. Choose Buttons – change the arrow styles. 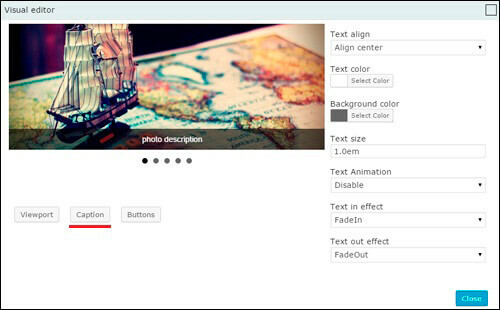 Read more about WordPress Slider Template Builder features here. Jssor Slider offers you to select the arrow and bullet styles from the long list of amazing variants. If all this info is not enough for you – no problem, don’t worry! You can find more about our plugin – Slider Plugin by Supsystic can be appropriate for all your requirements. Check out also the video tutorial of installation – we hope you will have no questions after this!